Calculate how much it costs to build a new deck, including all materials and labor. Get prices for different types of decks, based on your specifications - size, type of railing, material (wood, AZEK, Composite, Trex), etc. Pricing is also adjusted for your geographic location. Deck Height (from the ground) ft. Put in all measurements and project details to get an accurate cost estimate for your deck. First, enter the size of your deck. You can later adjust this. This is an important factor that can change your total cost at least by a few hundred dollars. In the default settings, we include a deck size of 360 sq.ft. and 10 posts. If your deck is attached to the house wall, and it is 12' x 30' (360 sq.ft. ), you will have 3 posts on each 12' run, and additional 4 posts on the long side (corner posts were included on short sides). This gives you a total of 10 posts. 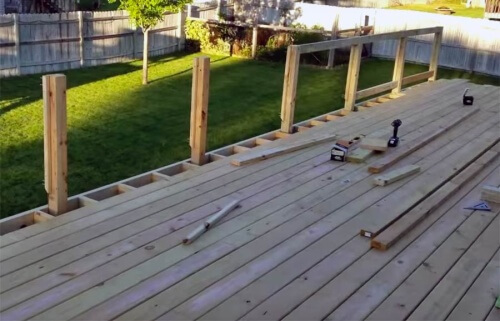 If your deck geometry is different, you may have more or fewer posts. It is ideal to keep a 6 foot distance between posts, which is a standard length of railing sections. You can space them more frequently - for example at 4 or 5 feet apart. However, this will result in waste of materials. You should not exceed 6 ft. spacing between railing posts, as that can make using your deck unsafe. If you want to build a deck, chances are you will need to construct all the supporting structures from scratch. Therefore, most people should choose "Build New Deck + Footings"
This means that in your estimate you are also including pouring new concrete footings that will support your deck. If you already have a deck and need to "renew" it with Pressure Treated or Composite material, but want to leave the old framing in place (maybe do a few small repairs as well) select "Replace Boards and Railings Only". If your existing deck is in bad shape, and the frame is rotted - you should remove both the old deck together with the frame, and build a new one. However, you can reuse old footings. In this case select "New Deck + Rebuild Frame"
We provide 5 options that are widely used in US and Canada - Pressure Treated Wood, Trex decking, (or similar grade) Composite, AZEK (or similar), Cedar / Redwood and "Store Brand" Composite Deck. If you are on a tight budget a Pressure Treated (PT) wood deck is the most affordable option, while an AZEK deck is the most expensive. A composite material is somewhere in the middle of the price spectrum. See the table below, which shows how much each type of decking costs per square foot, as well as total construction price. NOTE - Material cost is for DECKING BOARDS only. It does not include frame, footings, railings, fasteners, etc. Material Cost / sq. ft. Installed Cost / sq. ft. The most expensive part of this project is professional labor, as well as all other materials you need in addition to the surface boards themselves. Depending on the complexity of design and required materials, you are looking to spend $19-40+ on professional construction. For a more accurate estimate, contact a local building pro. We recommend getting at least 3-4 price quotes to find the best deal. Keep in mind that if you need to level or grade the land before beginning construction, this will cost more. The average price to grade 120 sq.ft of land is $800-1,150, or $6.6 - 9.5 per square foot. Another hidden expense that most homeowners forget to include is the cost of a building permit. Depending on your local town regulations, a building permit for a deck can cost anywhere from a few hundred to almost $1,000. 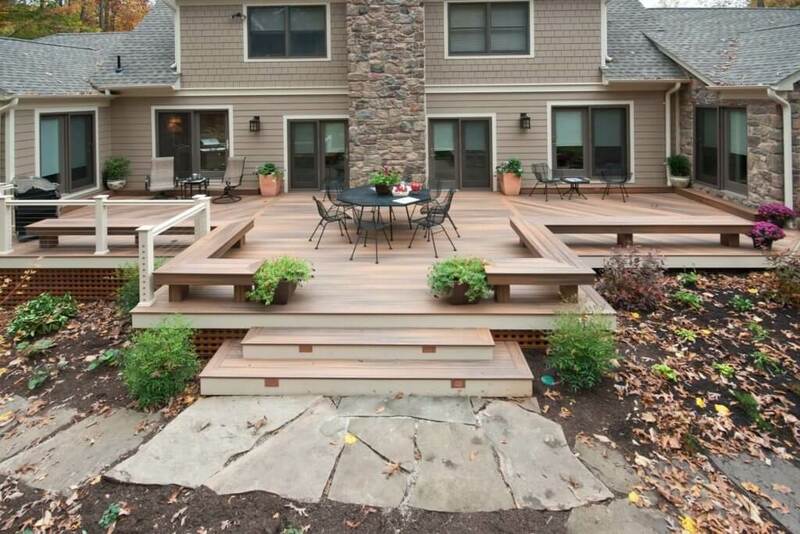 The design of you deck will have the biggest overall impact on the total cost. The estimates provided here are for a one level, raised rectangular deck with railings. If you want multiple levels, stairs, oval or odd shapes, etc., expect your budget to skyrocket. A custom design can easily be at least 3 times the price of a standard deck of the same size. If you don't have a high-end home, spending thousands of dollars on a fancy deck may not be financially smart, because you will not be able to recoup your investment. Instead, think of a size and design that will be a happy medium between your budget and entertainment needs. Making your decision based on price alone is one way to go. However, each product has a unique set of features, as well as pros and cons. Here are some tips to point you in the direction of a deck that will enhance your outdoor living for many years to come. 1. How much maintenance are you willing to do? Different materials require varying levels of maintenance. 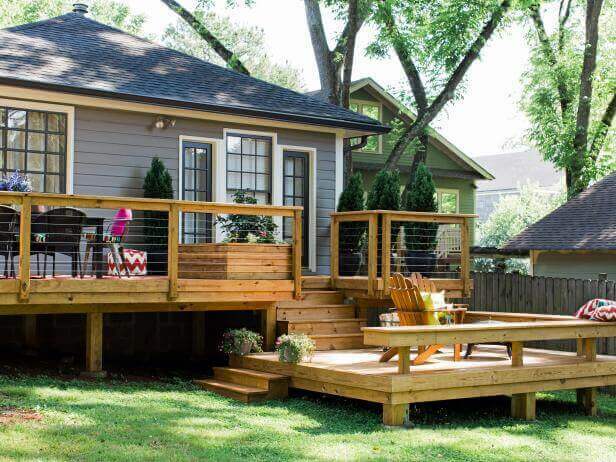 For example, a wood deck calls for the most maintenance, and it also must be done on a regular basis. You will need to clean it at least once a year, and treat/re-seal it every 2-3 years. If you are not into spending a lot of effort on upkeep, then PVC (AZEK) or composite decking is a better choice. These require almost no maintenance, just occasional washing to keep it looking nice and clean. Decks are not created equal in how long they will last. This feature is also reflected in their cost. The least durable and lasting is pressure treated wood. Therefore, it is also the cheapest. Other woods, such as cedar or ipe, will last significantly longer, but they too will eventually be susceptible to rot, mold, moisture penetration and overall degradation. Composite materials, such as Trex, is the second best option in terms of longevity. They have a service life of 25-30, which is twice as long as most woods. Finally, a PVC plastic deck will last the longest and is the most weather and rot resistant. Hence, its on the highest end of the price spectrum. A state-of-the-art synthetic deck can last 40 years or more. Some manufacturers even offer "Lifetime" warranties on these materials. When searching for a perfect deck, its important to consider aesthetics. First and foremost, it should complement the overall architectural style and color of your home. A beautiful deck can add some serious curb appeal. This is a nice bonus, if you are planning to sell your house in the near future. Moreover, keep in mind what type of building material you are drawn to. Some people absolutely love the natural look of wood and do not enjoy anything else, regardless of the amount of maintenance it requires. 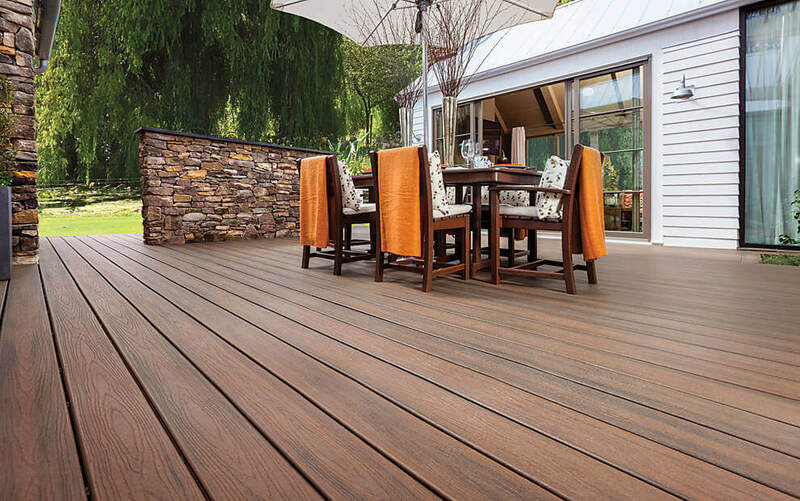 At the same time, technology has made leaps in terms of creating composite and synthetic decking that comes pretty close to the warm look of real wood. Additionally, there are colors and styles that would look great with modern architecture. If you want to build a deck yourself, wood is your best option. Whether you go for pressure treated wood, cedar, Ipe or any other species, it easy to purchase all required materials and construct the deck on your own. 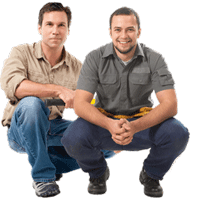 Similarly, you can do all maintenance, painting, and repairs yourself without spending money on professional contractors. On the other hand, synthetic and composite decks are not considered DIY friendly.